Professor Donald A. Glaser was a master of experimental science throughout his career. Born in Cleveland and educated at Case Institute of Technology, he earned a doctorate at Caltech and taught at the University of Michigan before accepting a post at UC Berkeley in 1959. 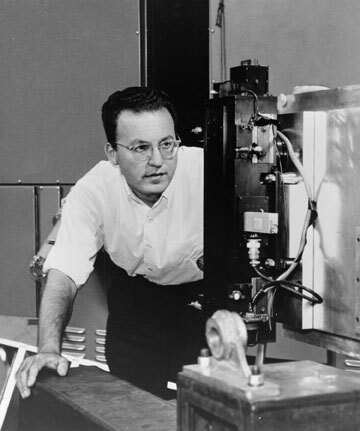 Early in his career, Dr. Glaser experimented with ways to make the workings of sub-atomic particles visible. For his subsequent invention of the bubble chamber, he was awarded the Nobel Prize in Physics 1960. He then began exploring the new field of molecular biology, improving techniques for working with bacterial phages, bacteria, and mammalian cells. By designing equipment to automate his experiments and scale them up, he could run thousands of experiments simultaneously, generating enough data to move the science forward. Recognizing the implications for medicine, Dr. Glaser and two friends created the pioneering biotech company Cetus Corporation in 1971, thus launching the genetic engineering industry. Later in his career Dr. Glaser continued his experimental research, developing mathematical models for understanding fundamental processes of human vision. Throughout his life he balanced scientific work with an equally passionate interest in classical music, playing viola in chamber music ensembles wherever he went. Avidly curious, innovative, and devoted to the advancement of scientific knowledge, Dr. Glaser was a much sought-after consultant and advisor before his death in 2013. Physics 111 experimentation laboratory is an intensive 3-unit laboratory course for 3rd- and 4th-year physics students at the University of California at Berkeley. It follows the Physics 111A Instrumentation Laboratory , which introduces students to electronics, measurement techniques, signal processing, computerized data acquisition, and control. With these tools, students in the Experimentation Lab section of Physics 111 undertake four experiments, each taking about 2 weeks to perform. The students select these experiments from 19 or so experiments permanently set up in the 111-Lab. They represent a wide range of topics and techniques used in experimental physics. Many of the experiments replicate Nobel prize-winning studies and all are designed to develop skills essential to research. NOTE 1: To reduce overhead and risk of getting inconsistent data, you must make sure that you have blocks of consecutive afternoons to complete some of the experiments (see the list of available experiments for this requirement Equipment Signups). NOTE 2: All students log into bCourses, complete the Signature Card, and submit it online before you come to the Lab. You must complete this before starting anything in the Lab. NOTE 3: All students come to the introduction meeting on the first Day of Class in 286 LeConte Hall at 1:00 PM. NOTE 4: Each student must have your picture available in the University of California at Berkeley's bCourses site. If NOT you must then turn in a PASSPORT PHOTO (not your passport but an actual passport-style photo) on the first day of Lab for security purposes. NOTE 5: All Advanced Lab Students are required to do the Error Analysis Exercise (THE NEW Error Analysis Exercise IS READY, PLEASE GO AHEAD AND DO IT) assigned during the first week (see due dates). NOTE 6: Prepare yourself for one mandatory Oral report with a professor. This can be on the first, second, or third experiment. Go to Calnet Active Directory and Synchronize your CalNet name. Attention: There is NO eating or drinking in the 111-Lab anywhere, except on the benches with the BLUE strip around in Room 282 and 286 LeConte. Reprints and other information can be found on the Physics 111 Library Site. This site supplements the Instrumentation site Physics 111A Instrumentation course by providing the lab manuals for each experiment in the Physics 111B Advanced Laboratory. Each link in the "Advanced Lab Experiments" menu at the top leads to pages containing a guide to the experiment, including Pre-Lab Questions, Mid-Lab Questions, references, theory, and instructions. You can view and print any pages on this Advanced Lab site without having an account or logging in. If you see errors in the lab write-ups or places that need improvement, talk to your instructors or Winthrop Williams. They can edit the pages quickly to make minor changes so that the next student gets the improved version. If you see the need for extensive revisions, print out the page and write in your suggestions to give to the instructor. You can also write comments in the evaluation survey at the bottom of the write-up, and we will make changes as needed if they propose some useful improvements. We really value input from students to make the labs better. This site is open to the public to view but not to edit or comment. Copyright is held by the University of California Regents. However, we gladly make content available to other schools for non-profit educational use. Some links to copyright-protected references and software are not available to anyone without authentication as a Physics 111 student or staff. This site was developed by Don Orlando and Segre Students. A Segrè Intern, Nathan Belmore, spent much of July 2014 converting the lab write-ups from Wiki to Drupal, designing the new website and converting all the codes. Winthrop Williams currently administers the webpages. The teaching staff and Winthrop Williams do the editing and maintenance.